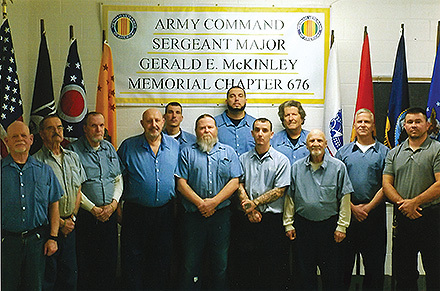 Working with the Buckeye State Council, members of Incarcerated Army Command Sergeant Major Gerald McKinley Memorial Chapter 676 at the Lancaster, Ohio, South East Correctional Facility recently completed a twenty-one-week program called Warrior Spirit Support Group. The group was made up of veterans of the Korean, Vietnam, Afghanistan, and Iraq wars, and covered subjects such as anger management, cognitive behavioral therapy, empathy, conflict resolution, and drug and alcohol abuse. “The warden, Mr. Brian Cook, and his staff are fully supporting this program and are very supportive of Chapter 676 and all of their activities,” said Don Jones of the Buckeye State Council. The next class is already forming.